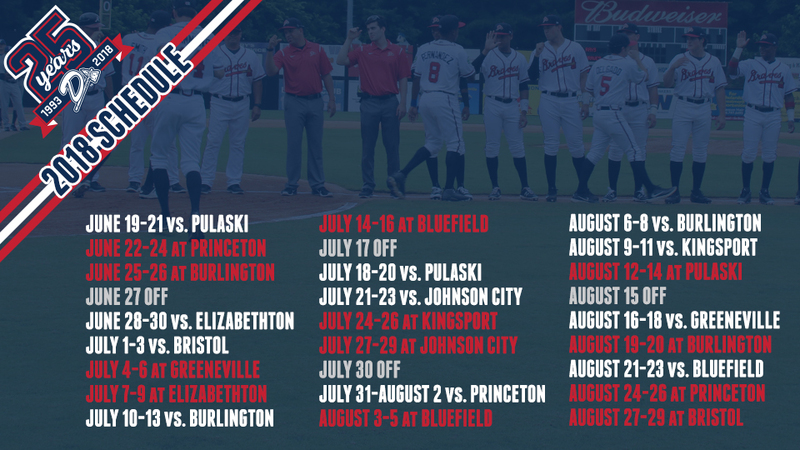 DANVILLE, Va. - The Danville Braves today released their 2018 schedule, which will begin on Tuesday, June 19 with a home game against the Pulaski Yankees. The 2018 Opening Day contest marks the first time since 2013 that the D-Braves will open the season at home at American Legion Post 325 Field and the third time in the last four seasons Danville will start the season against Pulaski. The 2018 season will be the Danville Braves 26th in the Advanced Rookie Appalachian League; the organization will celebrate its 25th anniversary throughout the season, marking 25 years in Danville from 1993 to 2018. The D-Braves will once again play a total of 68 games, with 34 at home and 34 on the road. The 2018 schedule features six home games in June and 14 in both July and August. There are four league-wide off days - June 27, July 17, July 30, and August 15. The 2018 Appalachian League regular season will conclude on August 29, with playoffs beginning August 31. The D-Braves final regular season home contest of 2018 is scheduled for August 23 against Bluefield. Season tickets and mini plans for the D-Braves 25th anniversary season are on sale now and can be purchased by calling 434.797.3792. Individual game tickets will go on sale online on Monday, April 2 at 10 a.m. Please visit dbraves.com for more information. Click here to view the complete 2018 Danville Braves schedule.